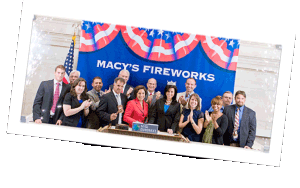 On July 3rd, 2012, Pyro Spectacular’s very own Gary Souza closed trading at the New York Stock Exchange. While sounding the closing bell simultaneous low level fireworks were displayed. Check out this video to see all the action! Macy’s Fourth of July Fireworks are the nation’s largest Fourth of July pyrotechnic display. Produced by Macy’s and designed in conjunction with Pyro Spectaculars by Souza of Rialto, CA, Macy’s Fireworks are a digitally synchronized display of firepower that is choreographed to a rousing patriotic score. Annually fired from various locations across New York City, Macy’s Fireworks feature shells from all over the world. Seen by more than 3 million spectators and millions of viewers nationwide, Macy’s Fourth of July Fireworks have become the nation’s premiere Fourth of July celebration event.